I’ve been using Windows and PCs for most of my life. It’s worked well for me… no regrets, but it’s been sad to watch Microsoft try to keep up with Apple in some regards. Apple nailed it with the iTunes. Initially it was the tool to digitize music and load an iPod, but grew into a powerful media outlet. Microsoft has never been able to close that gap on entertainment devices or media sales. Zune who? Well this last Black Friday, Microsoft got my attention with ten cent movies at the Microsoft Store. I clicked. The first catch was it was for movie rentals, not purchases. That was a disappointment that was easy to avoid – “rentals” being the operative word. Ten cents is a bargain either way, but a much smaller bargain that I initially expected. The second catch was that the movies can only be viewed on a Windows 10 device. I currently have one Windows 10 device – a Surface Pro 3. This is my travel computer, and it rarely gets used at TalkingPointz world headquarters. I don’t think I have an easy way to watch a Windows-10-only movie (on a TV) at home. I guess I could use my Chromecast, but who knows if that’s supported. Still, for 10 cents, it could be good to have a movie for a trip. I have two trips remaining this year: San Francisco for Cisco Collaboration Summit and a comms expedition to Buenos Aires. Now I just need to figure out how long a ten cent rental lasts. That should’ve been an easy question,. but as far as I can tell the only way to get the answer is within the checkout process. Now my buyer’s journey has gone from click-bait to checkout – and I’m still just trying to figure out the offer. Wait it gets worse. Unfortunately, my Windows 7 computer won’t allow me to checkout (the rental option is grayed-out). 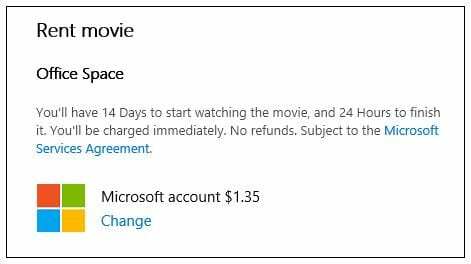 Microsoft Store movie rentals – purchase AND playback – are limited to Windows 10 devices. Fourteen days is a reasonable term, but 24 hours to finish was the deal breaker. It’s hard to rely on flight time during business travel. There may be urgent email matters, deadlines, or even sleep that must take priority. The problem is upon arrival, I won’t be able to finish until the return flight which is more than 24 hours later. I wonder if I can rent the movie twice for twenty cents (once for the flight out and once for the return). I can remember how easy it was to take Redbox and Netflix DVDs on trips and just returned them during the travel. Digital content should be even easier, but this 24 hour clock restriction is problematic. This is probably why I prefer watching television shows on flights – they come in increments of 30 or 60 minutes (actually less without commercials). There is also the issue that I only get about 3 hours of battery out of my Surface Pro 3. That’s should be long enough, but only if I get on the plane with a fully charged PC. The flight to Argentina is certainly long enough to finish a movie, but I was thinking of taking the Chromebook on that trip. On longer and/or international trips I feel more comfortable taking a low cost Chromebook that doesn’t have much data. I can load it with movies, but obviously not a film restricted to a Windows 10 device. I’m not sure I can rent movies on the Chromebook at all. I gave up on the ten cent rental. It’s a shame that our technical progress hasn’t yet caught up to the simplicity of DVDs. Ironic really that software is harder than hardware.